These heart-shaped wood guitar picks are specifically designed for a great grip. 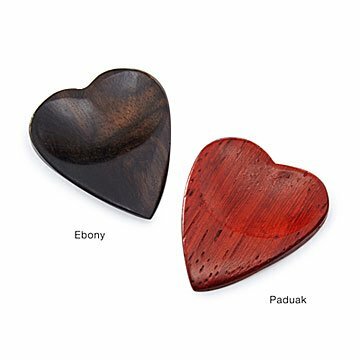 Crafted from beautiful woods, these heart-shaped guitar picks are specifically designed for players who prefer a precise tip (a pointed "Jazz" tip) but also demand a great grip. They feature a double dimple that positions the thumb and a scoop on the opposite side for the first finger—a design which stops the pick from rotating and ruining your next note. Padauk is a soft, mahogany-like wood that offers extremely warm tones. Ebony is an extremely hard wood that offers clear, clean tones that add brightness to most guitars. Made in India. This will be a Valentine's Day gift for my man. It's hasn't been tested yet, but my first impression was that it's quite small. He has large fingers, so I hope he can use it comfortably. We shall see. He hasn't died it out yet but I know he will love it! Looking forward to buying another! My boyfriend has used the pick and absolutely loves it! Even asked if I could get him another in maybe a different color even. Makes a louder sound with the strings and makes it possible for him to practice without an amp! She uses it daily as she plays in the band at school and of course practicing at home. My husband loves this. Great gift! Got these as gifts for my Brother. He has played guitar for years and will love them. My son says after a period of admiration, he'll use them. I couldn't chose and bought both colors.